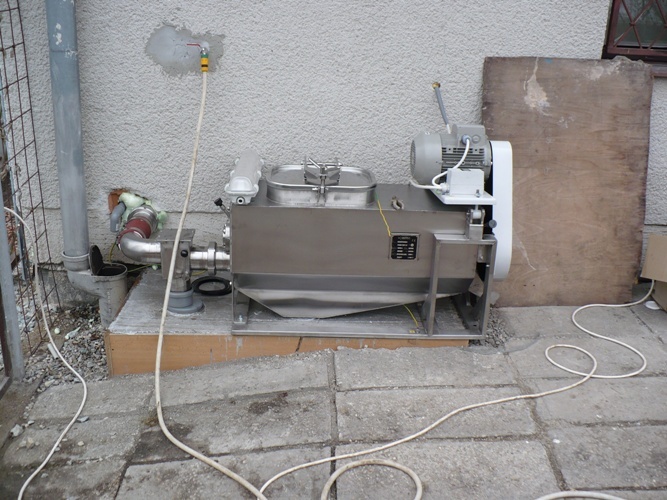 The stone removal machine serves to separate stones from the fruit stillage, which arises during the brewing process, during the operation of a fruit distillery or similar operation. It reliably separates the stones that do not pass through the holes of the cylindrical screen (diameter 7 mm). The stillage is used as a raw material in composting plants and biogas stations, or is sent to a wastewater treatment plant. In which case, it must not contain any stones. This is no problem with a DESTILA stone removal machine. It is mainly used for the separation of apricot, plum, greengage and mirabelle stones. When processing cherries and sour cherries, the separation efficiency is lower. installation of the stillage pipe and functional testing are included in the supply. The DESTILA stone removing machine is a rotating machine, the main part of which is a square stainless-steel bath. A cylindrical sieve and a shaft with three scrapers in the shape of a tightly-wound spiral are inserted between the flanges. The drive of the inner part (the shaft with scrapers) is provided by a V-belt drive electric motor (4 kW). The electric motor is mounted on a swing plate that allows belt tensioning. A distributor is mounted at the stillage outlet to control the flow. It can be led to for stone removal inside or outside the machine. The stone removal machine is most often installed nearby the distillation boilers. 1LA7 113-4AA10; 4 kW; 1400 rev./min.